1). Tesla. Combined sales of Model S and Model X have topped 19,000 units commanding just under 30% of the EV market. Model X reached almost 7,000 units and Model S, refreshed in April, sold just over 12,000 new vehicles through June. The 373,000 Model III advance deposits provide a nice tailwind, as does the recent price reduction on the 2016 Model S (about $5,000 less than a comparably equipped 2015: see our earlier post (New Tesla Model S 60: A good value?). 2). VOLT. The all new 2017 Chevrolet VOLT is outselling it’s Gen 1 model by 73% with sales just under 10,000 vehicles through mid-year. Plug-In hybrid buyers know that the VOLT is their best option for daily electric commutes and the range to go the distance (400 miles). Chevrolet dealers might be getting better at selling the new VOLT; or at least not ‘unselling’it to well educated PHEV buyers. 3). Ford. Ford’s Energi models (C-Max and Fusion) along with the Gen 1 Ford Focus Electric managed to grow unit sales +26%. Ford, through CEO Mark Fields, has committed to invest $4.5 Billion to electrify its product line and offer at least 13 electric models in the near future. Watch the Blue Oval. 4). New EV offerings in total helped support Plug In growth. BMW X5 Drive40e, Audi A3 E-tron, Volvo XC90, VW eGolf and Hyundai Sonata plug in all have added just under 9,000 vehicles through mid-2016. Most of these models did not exist in early 2015. Two EV have lost significant sales base in 2016: Nissan LEAF (under 6,000 units/-41%) and BMW i3 (under 3,000 units/-36%). Nissan needs to launch the GEN 2 LEAF as soon as possible and BMW may need to adjust the value equation for its i3. At $42-50,000 the 84-110 mile EV is crossing into Tesla territory. What can we conclude from 2016 so far: new product with longer range is driving market growth and the impact of ‘cheap’ gasoline appears to be part of the history of 2015 Plug In EV sales. Growing charging infrastructure is building confidence in EVs and is slowly chipping away at ‘range anxiety disease’. Major public utilities commitments to building out EV charging infrastructure, especially in California and in the Pacific Northwest is a harbinger of what can be expected across the US: public/private enterprise to support EV charging station build out. Tesla inventories are reportedly a tad high and the Detroit and Asian Automakers always run ‘end of model year’ clearance sales. Now might just be your time to get into an EV metro Atlantans! Categories: #Automobiles, #ElectricVehicleChargingStations, #ElectricVehicles, #EV, #EVSales | Tags: #Atlanta, #BMWi3, #FordEnergi, Georgia, LEAF, Tesla, VOLT | Permalink. ATLANTA – The City of Atlanta announced today it will deploy one of the largest municipal fleets of electric vehicles in the United States by the end of 2015 under legislation approved this week by the Atlanta City Council. The measure is part of Mayor Kasim Reed’s agenda to ensure that Atlanta is one of the nation’s leading cities for sustainability, and will reduce the city’s dependence on fossil fuels while saving taxpayers thousands of dollars per year. The new fleet deployment complements the existing efforts of the Mayor’s Office of Sustainability to support electric vehicles such as the recent installation of the first public charging station on Mitchell Street near Atlanta City Hall. The charging station is free and open to the public. Spearheaded by the Mayor’s Office of Sustainability, the new vehicle fleet program is aligned with the City’s Power to Change Plan which seeks to reduce vehicle emissions by 20 percent by the year 2020. In partnership with Vision Fleet a plug-in vehicle fleet company, the City of Atlanta developed an innovative financing structure that bundles together all the expenses of purchasing, fueling and maintaining the electric vehicles into a guaranteed rate that is a lower cost than conventional vehicles. Additionally, Vision Fleet will utilize its comprehensive suite of technology, data analytics, and provide operational support designed specifically for reducing the cost of ownership of alternative fuel vehicles. The City of Atlanta fleet vehicles will include 100 percent electric models, such as the Nissan LEAF, as well as plug-in hybrid models like the Chevrolet Volt and the Ford Fusion Energi. Cars will be distributed throughout the city’s fleet based on the needs of each department. Categories: #CityofAtlanta, #CleanCitiesGeorgia, #ElectricVehicles, #EVChargingStations, #GeorgiaPower, #NRG, #SACE | Tags: #Atlanta, #Carbon #Emission, #electricvehicle, #fleet, #sustainability, LEAF, VOLT | Permalink. A LEAF with a 500 mile electric change? A Tesla Model S over 1,800? What if the range of a Nissan Leaf was 500 miles vs. 73-80 today? With a range of over 1,855 miles, a Model S might never need to see a SuperCharger again! Whether the 7X lithium ion comes to pass or not, one thing is for sure: there is a lot of R&D time and money being invested in higher capacity, faster charging batteries which will all but eliminate ‘range anxiety’ in EVs! With almost 250,000 on the road in the US, EVs, in all of their forms, are here to stay! Categories: Electric Vehicles, EV Charging Stations, EV Sales Data, EV Tax Incentives, EVSE Providers, Home Charging Systems | Tags: #Battery, #Carbon #Emission, #Electric, #Gigafactory, #Lithium, #sustainability, LEAF, Tesla | Permalink. Zach Shahan, publisher of Cleantechnica and EVObession explains why Electric Cars will dominate the next decade and shares some terrific cost of ownership comparisons, in line with data the Editors of this blog have posted recently. Electric vehicles sales passed 500,000 units in the US this month. The EV revolution is on! Follow Zach at @cleantechnica, @evobsession and @ZShahan3 for the latest information on Clean Energy and Electric Vehicles. 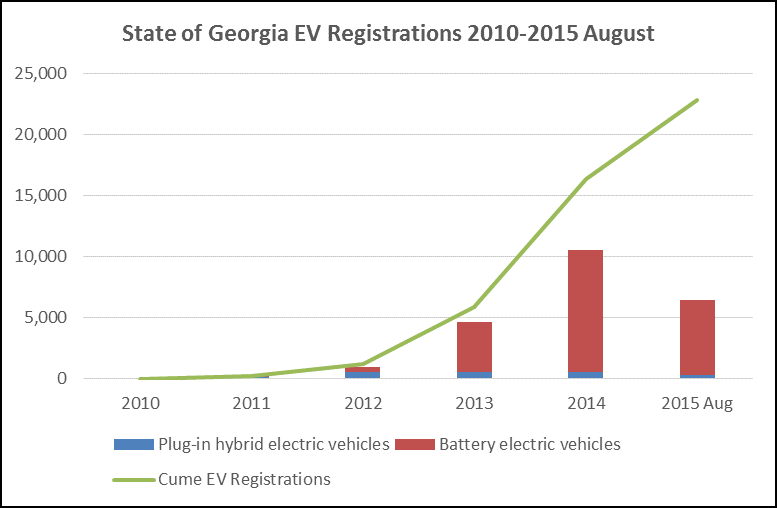 Categories: Electric Vehicles, EV Charging Stations, EV Sales Data, EV Tax Incentives | Tags: #Atlanta, #Carbon #Emission, #electricvehicle, Clean Energy and Electric Vehicles, CleanCitiesGeorgia, Electric Cars, electric vehicles, Georgia, green, hybrid, LEAF, PHEV, Zach Shahan | Permalink.